Mallory Capretta hasn’t let a little thing like pregnancy slow her down. 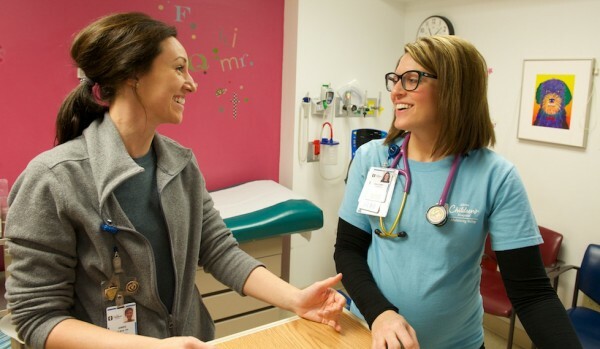 Expecting her second child in May, the Youngstown native isn’t having any trouble keeping up with her patient load on this busy morning in the emergency department at Akron Children’s Beeghly campus. 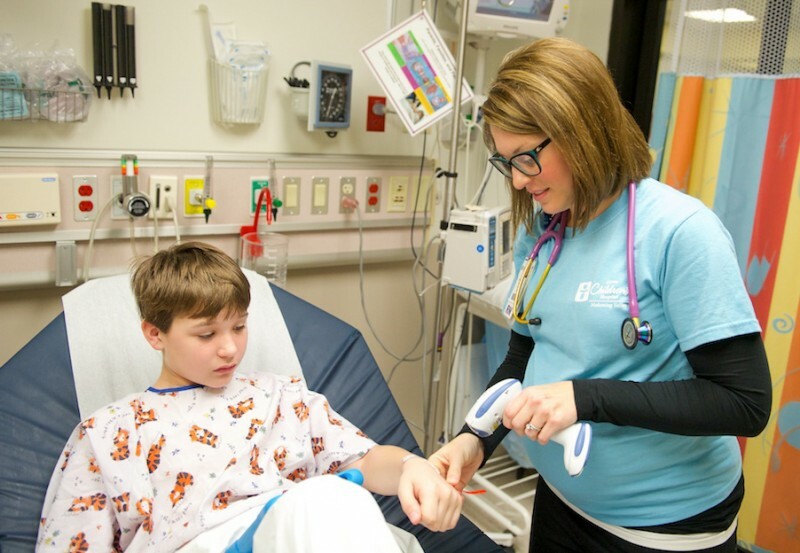 She greets patient, 11-year-old Hayden, and learns he has a history of asthma and recently has had a fever and sore throat. Mallory explains that Hayden’s doctor has ordered a bronchodilator treatment to decrease the swelling in his upper airway, as well as a long-acting steroid to help diminish his respiratory symptoms over the next few days. Hayden’s eagle eyes spot something in Mallory’s hand and he anxiously asks her if he will be getting a shot. Mallory works 12-hour shifts 3 days a week. Over the course of a day as many as 9 registered nurses work in the 18-bed emergency department at any given time. On this particular morning there are 5 nurses who are each assigned 3 patients. Every 4 hours the nurses switch assignments and later this morning Mallory will take a shift in triage. Growing up with a mother who was a critical care nurse at St. Elizabeth’s, Mallory knew from a young age she also wanted to be a nurse. 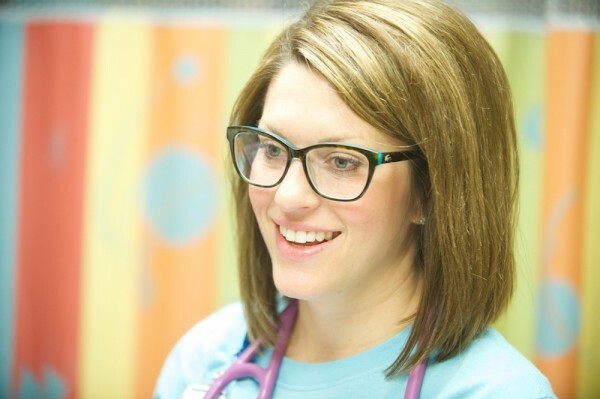 Having spent a number of years commuting to Children’s Hospital of Pittsburgh for work, Mallory was excited when Akron Children’s opened its Beeghly campus in 2008. After spending part of her morning treating a 13-month old for intractable vomiting and a 16-year-old non-compliant diabetic, Mallory enters the room of 7-year-old Nashawnn and introduces herself. Nashawn was brought in by his father for a low-grade fever and wheezing. She asks about any allergies, checks his vitals, and then explains she’s going to swab his nose for the flu. “It’s common practice to check for the flu because we’ve been seeing a lot of flu cases lately,” Mallory said. After giving Nashawnn some Motrin to bring down his fever, Mallory asks if there’s anything else he needs before she leaves. “Can I have a popsicle, please?” Nashawnn asks. “What color would you like?” she asks him back. 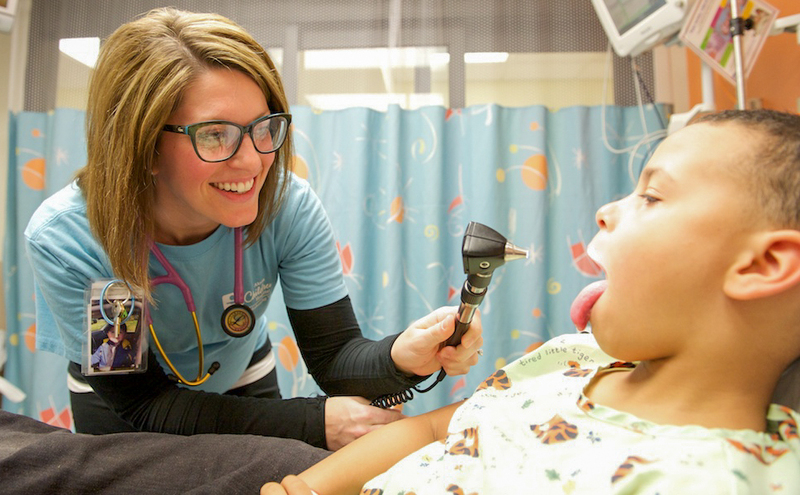 In addition to her clinical duties, Mallory’s other jobs include getting things – like popsicles – to make her patients more comfortable and changing bed linens when Environmental Services personnel aren’t readily available. “We do whatever we need to do to pitch in – especially on days when the census is high and we have a line of patients waiting to be seen,” Mallory said. At 11:30 a.m. the Fast Track section of the ED is set to open. This is good news for the 15 lower acuity patients currently sitting in the waiting room. Mallory checks back on Hayden, who says he’s feeling much better. “You aren’t making that funny wheezing noise anymore,” she said. Mallory informs Hayden’s mom his rapid strep test came back negative, but as standard hospital procedure she will send it out for culture just to double check. She gives them discharge instructions for cough syrup and says Hayden can go back to school tomorrow if he remains fever-free. With 11 a.m. approaching it’s Mallory’s turn to take a 4-hour shift in triage. Because it’s so busy, she and another nurse will share the shift. Her first patient is 16-year-old Emily, who’s been suffering from a headache, fever and blurred vision for 4 days. She currently takes medication for rheumatoid arthritis and also suffers from celiac disease. Mallory checks Emily’s vitals and does a quick initial assessment of her medical history and allergies. She asks Emily to rate her pain on a scale of 1 to 10. “It’s about a 7,” Emily said. Although it will be a busy 4 hours of anxious parents and patients, Mallory welcomes the change of pace. The ED is currently on “red light” status. This means the triage nurses do a full assessment and assign patients an acuity level from 1-5 with 1 being the most critical. Common conditions seen in the ED include earaches, sore throat, belly pain, coughs, and cold symptoms. The Beeghly ED has dedicated suture techs who can stitch up lacerations and while there is no casting room, the nurses can clean wounds and splint limbs. Although Beeghly doesn’t have a dedicated behavioral unit in their ED, they also see patients who are at risk for self-harm. Some days are tougher than others, but having her own child, 3-year-old Max, helps Mallory empathize with the parents of her patients. “Being a mom really opened my eyes as to why parents do what they do for their children,” she said.